This article and a following one are about some simple iptables exercises on Linux virtual bridges. Linux bridges are typically used in virtualization environments. However, guest systems or even the host attached to a Linux bridge may become targets of "man in the middle" attacks. During such attacks the guests and the bridge may be manipulated to send packets to the "man in the middle" system and not directly to the intended communication partners. 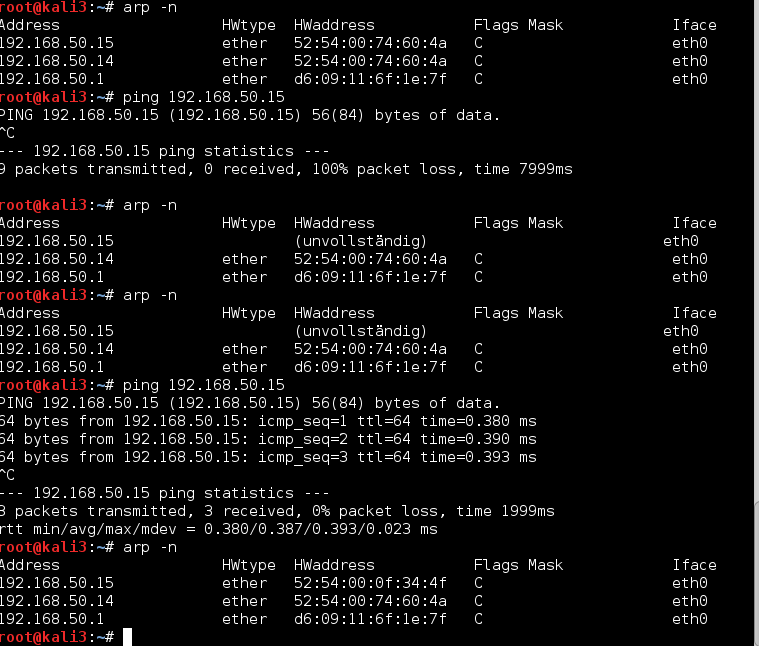 My objective is to get a clearer picture of iptables' possible contribution to defense measures against such attacks. I think these concerns justify a closer look at iptables rules with respect to bridge ports. Comments are welcome. In our test case we work with a KVM host with one bridge and later on also with two linked Linux bridges. In this first article we use one of the Linux guests on one of the bridges to initiate a "man in the middle attack" [MiM] against other guests of the very same bridge via ARP spoofing and packet redirection. We then define some reasonable iptables rules with the intention to block the redirected traffic (to the MiM) and analyze the impact of these rules. In a second article we extend the game to 2 bridges and the host port at one of the bridges. I do not and would not recommend to base any packet filter security across a Linux bridge on iptables alone. If you must use netfilter on bridges always combine iptables with basic ebtables/arptables rules - and test thoroughly against different kinds of attacks which try to break guest isolation. Always be aware of the fact that a bridge creates a global context in which packets must be inspected and followed precisely in their changing role as outgoing or incoming with respect to the bridge itself and its virtual interface ports. Global connection tracking on the TCP/IP level may be dangerous. If you give the bridge itself an IP - a situation which I do not at all like from a security perspective - take extra care. Things get even more complicated with multiple bridges on one and the same host. Can we block the redirection of packets between ARP poisoned guests over the MiM system by means of IPtables alone? What relations of IP addresses and port devices have to be defined? And would a tool like FWbuilder support us reasonably enough with this task? or segregated network parts with all guests belonging to the same logical IP segment are coupled via STP and border Ethernet interfaces of a central Linux bridge? In both cases the spoofed communication may pass border NICs of a Linux bridge. In this first article on the topic we look at one bridge alone with three guests. In a following article we shall consider linked bridges. Let us assume that we have 3 guests "kali3, kali4 and kali5" on a Linux bridge "virbr6". The bridge device itself has no IP. The guest systems are attached to the bridge via standard tap device ports (vk63, vk64 and vk65, respectively) created e.g. by libvirt's virt-manager. See article KVM/qemu, libvirt, virt-manager – persistent names for virtual network bridge ports of guest systems about how to set persistent names for the bridge sided end of "tap"-devices. The corresponding Ethernet interface side (here "eth0") of the guest operative systems - i.e. the guest side of the tap devices - are given the following IP addresses: 192.168.50.13 (eth0), 192.168.50.14 (eth0) and 192.168.50.15 (eth0), respectively. How does the host see the bridge-ports? The veth pair explains the 2 MACs on port Nr. 2. A parallel look at the outcome of "ifconfig" or "ip link show" would show that port 3 actually corresponds to tap device "vk63", port 4 corresponds to "vk64" and port 5 to "vk65". And port 1? The Linux bridge itself could also work as an Ethernet device which could get an IP address on the host. We do not use this property here - nevertheless there is an Ethernet port associated with the bridge itself. The first digit pair in the Ethernet address of the port device (i.e. the bridge sided end of the tap device) has a "fe", whereas the Ethernet device of the Linux guest (i.e. the guest sided end of the tap device) has a "52". The rest of the digits being the same. Logically, and also from the perspective of the bridge, these are 2 different (!) devices (though incorporated in one virtual tap). From the point of view of the bridge multiple MACs or even a new bridge may be located at the Ethernet segment behind a port. Be aware of the fact that the so called "forward database" of a bridge [FDB], which relates MACs to ports, keeps track of the relation of our Linux guest MACs to their specific ports. Whereas the port MAC (with the leading "fe") is permanently associated with the bridge, the MAC of the guest may disappear from the FDB after a timeout period, if no packets are received at the bridge from this guest MAC address. to be sure that the bridge works in a switch like mode (and not as a hub). Note that this defines a timeout period for the bridge's FDB - i.e. after this period "stale" entries in the FDB of each bridge may be deleted. So the bridge may no longer know at which port the deleted MAC is located - and therefore temporarily flood all ports with packets. Therefore, bridge flooding is a situation we may need to cover with iptables rules later on. The continuous output of the first command will show you directly when a stale MAC entry in the FDB is deleted. If you issue the second command twice with a reasonable time period in between you may search the output for missing or new MAC entries of guests. Note further that we did not give the bridge itself any IP address! The bridge may therefore be called "transparent". As "virbr6" has no IP address the guests (kali3 to 5) can not directly communicate with the host through the bridge itself as an Ethernet device. Just for information: In our scenario the host can only be reached indirectly over a transparently linked second bridge (virbr4) and a further veth pair there which leads to an external Ethernet device with address 192.168.50.1. ICMP packages and regular pinging - what do we allow? When setting up iptables rules on bridges we must be precise and specific with respect to the packet direction across the involved bridge port interfaces. It is the perspective of the bridge and NOT the perspective of the guest that counts. I always use a 3D picture to be sure: Assume the bridge and its ports to be located above the guests. Then a packet going up is incoming, a packet moving downwards is outgoing. which are to be considered in the basic chains of iptables. This leads us to the next question: Which iptables chain is relevant here? That we need to set up FORWARD rules is also logical as the bridge does nothing else than forwarding packets between its ports and thus transfer the packets to attached destination guests or into segregated network parts behind some of the ports (with the "spanning tree protocol" STP set to ON). In a previous article of this blog we saw that a Linux bridge learns about the relation of MAC addresses and bridge ports - and thus pins a specific communication down to just the 2 involved ports of a specific communication (basic guest isolation). The bridge normally does not spread communication packets over all ports (at least with a setageing parameter > 0). Note that this does not help to prevent MiM attacks. As the bridge itself works on layer 2 it ignores IP-MAC relations during packet forwarding. (It may learn about IP-MAC relations only through the ARP protocol.) The bridge furthermore does not know whether routing may occur somewhere. And the guests themselves cannot ignore that situations where several IP addresses may be associated with one and the same MAC are possible. Because of all these reasons Ethernet packets are inevitably sent and forwarded across the bridge were the guests think they should be sent to - according to their own internal ARP tables, which become poisoned during the attack. Be aware, however, of the fact that this information tells us nothing about the present state of the FDB table of the bridge! Actually, due to our "setageing" parameter certain MAC addresses of guests may drop out of the forward list of the bridge, if the guests are inactive with respect to network communication, and this in turn may result in a subsequent (temporary) bridge port flooding. Anyway and whatever the precise reason - it is interesting that there obviously are circumstances under which the local poisoning of bridge guests may impact even the ARP table on the bridge host itself. On the defense side this may give us a secondary chance (besides monitoring the violation of ebtables rules) to detect ARP spoofing attacks: by monitoring the host's internal ARP table and analyzing its contents for implausible changes. Actually, on our bridge we would have to cover analogous variants of all of the above DENY rules for all other guest ports and protocols. Note that all these rules define fixed relations between each of the defined bridge ports, an associated IP and certain packet directions across the port: with iptables alone we are restricted to such types of relations. $IPTABLES -A Out_RULE_2  -j LOG  --log-level info --log-prefix "RULE 2 -- DENY "
$IPTABLES -A Out_RULE_3  -j LOG  --log-level info --log-prefix "RULE 3 -- DENY "
$IPTABLES -A Out_RULE_4  -j LOG  --log-level info --log-prefix "RULE 4 -- DENY "
$IPTABLES -A Out_RULE_6  -j LOG  --log-level info --log-prefix "RULE 6 -- DENY "
$IPTABLES -A Out_RULE_7  -j LOG  --log-level info --log-prefix "RULE 7 -- DENY "
$IPTABLES -A Out_RULE_8  -j LOG  --log-level info --log-prefix "RULE 8 -- DENY "
$IPTABLES -A In_RULE_11  -j LOG  --log-level info --log-prefix "RULE 11 -- DENY "
$IPTABLES -A In_RULE_12  -j LOG  --log-level info --log-prefix "RULE 12 -- DENY "
$IPTABLES -A In_RULE_13  -j LOG  --log-level info --log-prefix "RULE 13 -- DENY "
The same of course for bridge "virbr6". Note that our rules (produced by FWbuilder above) for the bridge ports vk63, vk64, vk65 would also work in case of a port flooding situation - if they are not circumvented by other leading rules. The latter being a point we shall come back to. What packets do we allow? $IPTABLES -A In_RULE_21  -j LOG  --log-level info --log-prefix "RULE 21 -- ACCEPT "
We need of course all variants for all the other bridge interfaces. To make life simpler you could define groups of recipients in a tool like FWbuilder. We need the "DENY"-rules first before we allow anything else - i.e. we need the basic DENY rules discussed above as the leading rules in all affected chains! If a packet is first allowed - e.g. due to some reasonable IN rule - then it definitely is allowed. To be on the safe side we, therefore, must probe the critical FORWARD rules for unacceptable outgoing and incoming packets over certain bridge ports, first. A really critical aspect in the context is a potentially applied overall acceptance of packets for established connections (connection tracking). For most stateful inspection packet filters the general acceptance of incoming packets for established connections is a default. Note, that these rules would cover ALL bridges and ALL related interfaces/ports on a virtualization host (global context of acceptance)! This makes such leading rules potentially dangerous on hosts with bridges! Both during ARP spoofing attacks, but also in port flooding situations - as the ports work in a promiscuous mode. Be aware of the fact that the attack pattern discussed above could in principle be extended to guests on other bridges on the host, if the attacker knew the relevant IP addresses. Whatever your FW-Tool generates: Edit the resulting script and move the acceptance rule for established connections after/below the set of critical "DENY" rules on the bridge interfaces discussed above. Check in addition that the DENY rules themselves really are set as stateless rules. You see the poisoning packets and the redirected (duplicated) messages between kali3 and kali5. The same would of course be true for any kind of real TCP/IP communication. So without any measures the MiM can follow all communication after spoofing. Good! Defense is obviously possible - even on the IP-level - as soon as we relate bridge ports to IP information! For our Debian guests this parameter typically has a value of 60 secs. Where do the reactions at other ports than vk64 come from? The first part of the explanation is that the bridge temporarily flooded all its ports (vk64, vk65, vethb1) with the ping requests of kali3! This in turn lead to local denial reactions on virbr6 and also on our second bridge (vribr4). For the reason of the flooding see below. The second strange thing is that during each of the nine ping trials a successful packet submission occurs through port vk65 - but there is no log entry for an answer packet. Why is this? Port flooding means copying of packets for the submission over all bridge ports other than the port of the incoming packet. The (in our case wrong) destination MAC addresses of the packets included. The bridge "hopes" for an answer of the addressed MAC at one of the ports. But is this going to happen in our test situation - in which kali3 sends requests out still to the wrong MAC of kali 4? No - because despite flooding and acceptance for transport over port vk65, kali5 rightfully ignores the copied packets due to their wrong destination MAC. On the other side kali4 will not receive anything due to the iptables rules and cannot react either. So, we end up in a situation where ICMP request packets are sent by kali3 - but no answer will return from any bridge port. This in turn leads to the fact that the bridge is not learning what it needs to learn to stop the flooding. This situation will at least remain until the ARP cache table on kali3 is corrected/updated. So only with a subsequent new ping series - and after the ARP table of kali3 has been updated - everything works as expected. Some reader asked me via mail to explain why flooding occurred at all. This is a good question - and I have therefore added relevant remarks into the text above. Due to our limited "setageing" parameter some "guest MAC - port" relation may be deleted from the bridges forward database (FDB) after some time. (In addition we may have impacts of the STP protocol.) With our setaging parameter and the active iptables rules kali5 will drop out of the FDB pretty soon (after 30 secs) : the original pinging during the attack situation will not reach kali5, and kali5 otherwise remains passive. However, also kali4 drops out 30 secs after stopping the spoofing attack from the FDB. So, we may reach a situation where kali3 still has the wrong ARP information, but kali4's MAC is no longer in the FDB. We ended up in a kind of race condition between timeouts of the bridge's FDB and ARP table cache renewal on the guests. Due to the fact that either of the spoofed guests may still have wrong ARP information after the spoofing is stopped by the attacker various strange situations may occur. kali3 may have the right ARP information, but kali5 not yet. Then answering packets may be created which try to reach kali4 instead of kali3. Such packets must not be allowed by any acceptance rules (including established relation rules) - hence again: we need the DENY rules first. What have we learned from all this? The stop of the ARP spoofing can leave the bridge and some of the guests in a unconsolidated mode for some time - despite a few final packets from the attacker system to restore ARP information on the attacked systems. One or two of the attacked guests and the host may still keep wrong entries in its/their ARP table(s). The duration of such a situation depends on the local timeout parameter for the ARP caching table entries on the guest systems. With a limited "setageing" parameter of the bridge, port flooding is not improbable during a period after the end of a ARP spoofing attack. As a consequence, the firewall rules must prevent the consequences of port flooding, too. Therefore, we need to take care not only of guest ports, but also of border ports which lead to segregated parts of the net or to other bridges. In the course of port flooding, response packets may be directed to wrong recipients. This status will remain until the ARP tables of the guests are updated. During such phase the defined DENY rules must be probed first before any kind of acceptance rules. Regarding the competition of the different timeouts on ARP caching tables and bridge FDBs: A conclusion in case of relatively stable guest-port relations might be to set the FDB timeout (setaging parameter of the bridge) to reasonably large values (in the range of a few minutes) to avoid flooding situations. On the other side the timeout for local ARP caching could be reduced as long as this does not create unreasonable ARP traffic. If we think a bit about the general rules discussed above, we may understand that they would work also for standard TCP/IP packets of general TCP protocols. Actually, we have defined the leading denial rules for wrong "IP/port/direction"-associations without any reference to a specific protocol. So, our rules should hold in the general case, too. The reader may test this by configuring one of the guests as a web server or by using "netcat" to set up a simple server on one of the bridge guests. We shall investigate a related full TCP scenario in one of the next articles - where we shall follow packets across 2 bridges and to the host. So, be patient, if you do not want to perform experiments, yourself. Obviously netfilter iptables rules can not prevent ARP spoofing and resulting "man in the middle attack" trials on virtual guest systems attached to Linux bridges of a virtualization host. However, properly designed iptables rules can intercept and interrupt the redirected traffic a MiM system attached to the bridge wants to provoke. Appropriate iptables rules testing predefined IP-port relations on bridges may therefore supplement and accompany additional measures on the ebtables/arptables level of netfilter. However, such rules should not be undermined by leading acceptance rules related to connection tracking. Even an already stopped ARP spoofing attack may leave the bridge and its guests in an unconsolidated status for a while. In addition flooding of packets to all bridge ports may occur. Appropriate denial rules for guest ports and Ethernet border ports in STP situations must block the resulting improper traffic. The reduction of flooding situations may require an adaption of the "setageing" parameter to reasonably large values for predictably stable configurations of guests on a bridge. Most important: General acceptance rules for established connections should only be applied in the sequence of firewall rules AFTER all critical (denial) rules regarding unacceptable traffic across certain ports have been tested for incoming/outgoing packets. This may require explicit changes of the scripts created by Firewall tools like FWbuilder. A significant problem is the requirement that the association of IP addresses and ports must be known or determined at the time of the definition and/or application of the filter rules. This requires persistent port naming techniques and under certain circumstances also persistent MAC distribution techniques plus DHCP restrictions for the guests within the used virtualization environment. we discuss how we can extend our rules to scenarios with multiple bridges on one host - and discover that we need a special treatment of packets crossing bridge borders. Whilst experimenting with KVM guests and netfilter iptables, I cloned some guest systems. The virtual network interfaces of the different guests (old ones and cloned ones) were created with reference to a "virtual network" - a "host only network" in my case. The corresponding bridge was defined via virt-manager. I found that one cannot always rely on a persistent "N"-number in the name "vnetN" of the interface devices of my virtual guests throughout cloning, further system changes and a reboot. I am not quite sure whether there is also an impact of systemd/udev - as I installed a new version of systemd during my experiments, too. Whatever exact reason: There are obviously conditions under which the name of a previously defined virtual NIC device of a specific guest may change due to a vnet-renumbering. In my case one of the guests originally had gotten a virtual NIC (tun device) with a defined MAC and a name of "vnet3". Later on (after cloning and other system changes) the guest's virtual NIC with the same MAC got a device name "vnet6" - although I had not touched its configuration. That the MAC was kept up is not surprising as it resides in the XML-definition file created for the guest when I configured it with the help of virt-manager. Such a change of the name of an Ethernet interface may of course become a disaster for the application of NETFILTER rules - especially for IPTABLES rules which directly refer to device names via the "--physdev" option. Your precious firewall rules may become worthless after a renaming of your virtual NIC. The "target" tag allows for the definition of a persistent device name (here: vk61). Note that the documentation says that the name chosen must NOT start with "vnet". I hope this helps other people who need persistent names of the device interfaces of their KVM guests! Typically, virtual "veth" Ethernet devices are used for connecting virtual containers (as LXC) to virtual bridges like an OpenVswitch. But, due to their pair nature, veth" devices promise flexibility also in other, much simpler contexts of virtual network construction. Therefore, the objective of this article is to experiment a bit with "veth" devices as tools to attach the virtualization host itself or other (virtual) devices like a secondary Linux bridge or a VMware bridge to a standard Linux bridge - and thus enable communication with and between virtualized guest systems. Sometimes you strongly wish to avoid giving a Linux bridge itself an IP. Assigning an IP to a Linux bridge normally enables host communication with KVM guests attached to the bridge. However, during attack simulations across the bridge the host gets very exposed. In my opinion the host can better and more efficiently be protected by packet filters if it communicates with the bridge guests over a special "veth" interface pair which is attached to the bridge. In other test or simulation scenarios one may rather wish to connect the host like an external physical system to the bridge - i.e. via a kind of uplink port. There are scenarios for which you would like to couple two bridges, each with virtual guests, to each other - and make all guests communicate with each other and the host. Or establish communication from a guest of one Linux bridge to VMware guests of a VMware bridge attached to yet another Linux bridge. In all these situations all guests and the host itself may reside in the same logical IP network segment, but in segregated parts. In the physical reality admins may have used such a segregation for improving performance and avoiding an overload of switches. In addition one can solve some problems with "veth" pairs which otherwise would get complicated. One example is avoiding the assignment of an IP address to a special enslaved ethernet device representing the bridge for the Linux system. Both libvirt's virt-manager and VMware WS's "network editor" automatically perform such an IP assignment when creating virtual host-only-networks. We shall come back to this point below. As a preparation let us first briefly compare "veth" with "tap" devices and summarize some basic aspects of Linux bridges - all according to my yet limited understanding. Afterwards, we shall realize a simple network scenario as for training purposes. A virtual "tap" device is a single point to point device which can be used by a program in user-space or a virtual machine to send Ethernet packets on layer 2 directly to the kernel or receive packets from it. A file descriptor (fd) is read/written during such a transmission. KVM/qemu virtualization uses "tap" devices to equip virtualized guest system with a virtual and configurable ethernet interface - which then interacts with the fd. A tap device can on the other side be attached to a virtual Linux bridge; the kernel handles the packet transfer as if it occurred over a virtual bridge port. "veth" devices are instead created as pairs of connected virtual Ethernet interfaces. These 2 devices can be imagined as being connected by a network cable; each veth-device of a pair can be attached to different virtual entities as OpenVswitch bridges, LXC containers or Linux standard bridges. veth pairs are ideal to connect virtual devices to each other. While not supporting veth directly, a KVM guest can bridge a veth device via macVtap/macVlan (see https://seravo.fi/2012/virtualized-bridged-networking-with-macvtap. In addition, VMware's virtual networks can be bridged to a veth device - as we shall show below. A "tap" device attached to one Linux bridge cannot be attached to another Linux bridge. All attached devices are switched into the promiscuous mode. The bridge itself (not a tap device at a port!) can get an IP address and may work as a standard Ethernet device. The host can communicate via this address with other guests attached to the bridge. You may attach several physical Ethernet devices (without IP !) of the host to a bridge - each as a kind of "uplink" to other physical switches/hubs and connected systems. With the spanning tree protocol activated all physical systems attached to the network behind each physical interface may communicate with physical or virtual guests linked to the bridge by other physical interfaces or virtual ports. Properly configured the bridge transfers packets directly between two specific bridge ports related to the communication stream of 2 attached guests - without exposing the communication to other ports and other guests. The bridge may learn and update the relevant association of MAC addresses to bridge ports. The virtual bridge device itself - in its role as an Ethernet device - does not work in promiscuous mode. However, packets arriving through one of its ports for (yet) unknown addresses may be flooded to all ports. You cannot bridge a Linux bridge directly by or with another Linux bridge (no Linux bridge cascading). You can neither connect a Linux bride to another Linux bridge via a "tap" device. The "vmnet"-Ethernet device related to a VMware bridge on a Linux host can be attached (without an IP-address) to a Linux bridge thus enabling communication between VMware guests attached to a VMware bridge and KVM guests connected to the Linux bridge. However, as this is an uplink like situation we must get rid of any IP address assigned to the "vmnet"-Ethernet device. Our virtual network shall contain two coupled Linux bridges, each with a KVM guest. The host "mytux" shall be attached via a regular bridge port to only one of the bridges. In addition we want to connect a VMware bridge to one of the Linux bridges. All KVM/VMware guests shall belong to the same logical layer 3 network segment and be able to communicate with each other and the host (plus external systems via routing). The RJ45 like connectors in the picture above represent veth-devices - which occur in pairs. The blue small rectangles on the Linux bridges instead represent ports associated with virtual tap-devices. I admit: This scenario of a virtual network inside a host is a bit academic. But it allows us to test what is possible with "veth"-pairs. 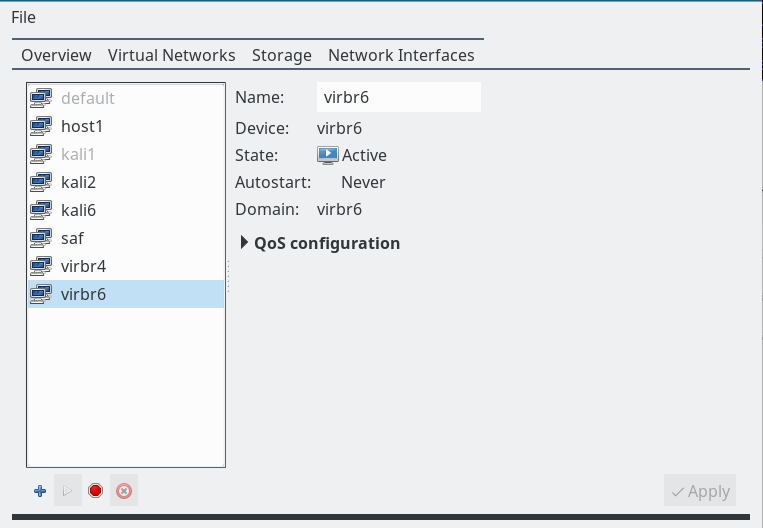 On our Linux host we use virt-manager's "connection details >> virtual networks" to define 2 virtual host only networks with bridges "virbr4" and "virbr6". Note: We do not allow for bridge specific "dhcp-services" and do not assign network addresses. We shall later configure addresses of the guests manually; you will find some remarks on a specific, network wide DHCP service at the end of the article. 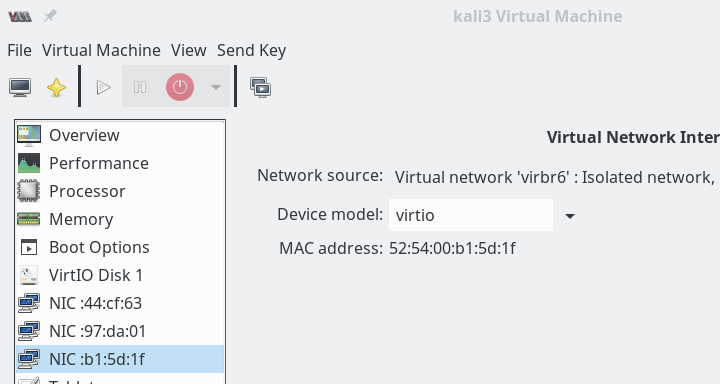 Then we implement and configure 2 KVM Linux guests (here Kali systems) - one with an Ethernet interface attached to "vibr4"; the other guest will be connected to "virbr6". The next picture shows the network settings for guest "kali3" which gets attached to "virbr6". We activate the networks and boot our guests. Then on the guests (activate the right interface and deactivate other interfaces, if necessary) we need to set IP-addresses: The interfaces on kali2, kali3 must be configured manually - as we had not activated DHCP. kali2 gets the address "192.168.50.12", kali3 the address "192.168.50.13". If we had defined several tap interfaces on our guest system kali3 we may have got a problem to identify the right interface associated with bridge. It can however be identified by its MAC and a comparison to the MACs of "vnet" devices in the output of the commands "ip link show" and "brctl show virbr6". Note that we do not see any IPv4-information on the "tap" devices vnet5 and vnet2 here. But note, too, that no IP-address has been assigned by the host to the bridges themselves. Ok, we have bridges virbr4 with guest "kali2" and a separate bridge virbr6 with KVM guest "kali3". The host has no role in this game, yet. We are going to change this in the next step. We may also configure the bridges with "virt-manager" to be automatically started at boot time. PING 192.168.50.12 (192.168.50.12) 56(84) bytes of data. 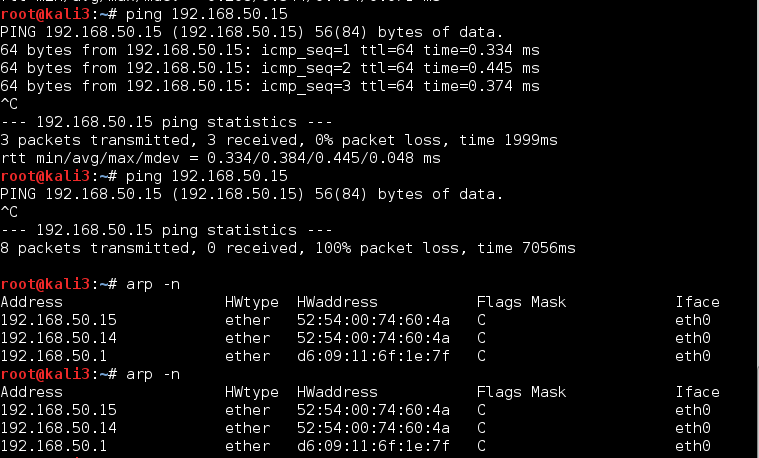 PING 192.168.50.1 (192.168.50.1) 56(84) bytes of data. So, we have learned that the host can easily be connected to a Linux bridge via an veth-pair - and that we do not need to assign an IP address to the bridge itself. Regarding the connection links the resulting situation is very similar to bridges where you use a physical "eth0" NIC as an uplink to external systems of a physical network. All in all I like this situation much better than having a bridge with an IP. During critical penetration tests we now can just plug vmh1 out of the bridge. And regarding packet-filters: We do not need to establish firewall-rules on the bridge itself - which has security implications if only done on level 3 - but on an "external" Ethernet device. Note also that the interface "vmh2" could directly be bridged by VMware (if you have more trust in VMware bridges) without producing guest isolation problems as described in a previous article (quoted above). Now, can we communicate from "kali3" at "virbr6" over the veth-pair and "virbr4" with the host? [Please, check the routes on all involved machines for reasonable entries first and correct if necessary; one never knows ...]. Yes, obviously we can - and also the host can reach the virtual guest kali3. PING 192.168.50.13 (192.168.50.13) 56(84) bytes of data. This was just another example of how we can use veth-pairs. We can link Linux bridges together - and all guests at both bridges are able to communicate with each other and with the host. Good ! Our last experiment involves a VMware WS bridge. We could use the VMware Network Editor to define a regular "VMware Host Only Network". However, the bridge for such a network will automatically be created with an associated, enslaved Ethernet device for and on the host. And the bridge itself would automatically get an IP address - namely 192.168.50.1. There is no way known to me to avoid this - we would need to manually eliminate this address afterward. Note that by creating a specific bridge to one of the veth devices we have avoided any automatic IP address assignment (192.168.50.1) to the Ethernet device which would normally be created by VMware together with a host only bridge. Thus we avoid any conflicts with the already performed address assignment to "vmh2" (see above). Great! What we expected! Of course our other virtual clients and the host can also send packets to the VMware guest. I need not show this here explicitly. veth-pairs are easy to create and to use. They are ideal tools to connect the host and other Linux or VMware bridges to a Linux bridge in a well defined way. Reasonable and precisely defined address assignment to the bridges and or virtual interfaces can become a problem with VMware as well as with KVM /virt-manager or virsh. Especially, when you want to avoid address assignment to the bridges themselves. Typically, when you define virtual networks in your virtualization environment a bridge is created together with an attached Ethernet interface for the host - which you may not really need. If you in addition enable DHCP functionality for the bridge/network the bridge itself (or the related device) will inevitably (!) and automatically get an address like 192.168.50.1. Furthermore related host routes are automatically set. This may lead to conflicts with what you really want to achieve. Therefore: If you want to work with DHCP I advise you to do this with a central DHCP service on the Linux host and not to use the DHCP services of the various virtualization environments. If you in addition want to avoid assigning IP addresses to the bridges themselves, you may need to work with DHCP pools and groups. This is beyond the scope of this article - though interesting in itself. An alternative would, of course, be to set up the whole virtual network with the help of a script, which may (with a little configuration work) be included as a unit into systemd. Here we have a bit of a problem with Opensuse 13.2/Leap 42.1! The reason is that systemd in Leap and OS 13.2 is of version 210 and does not yet contain the service "systemd-networkd.service" - which actually would support the creation of virtual devices like "veth"-pairs during system startup. To my knowledge neither the "wicked" service used by Opensuse nor the "ifcfg-..." files allow for the definition of veth-pairs, yet. Bridge creation and address assignment to existing ethernet devices are, however, supported. So, what can we do to make things persistent? Of course, you can write a script that creates and configures all of your required veth-pairs. This script could be integrated in the boot process as a systemd-service to be started before the "wicked.service". In addition you may configure the afterward existing Ethernet devices with "ifcfg-..."-files. Such files can also be used to guarantee an automatic setup of Linux bridges and their enslavement of defined Ethernet devices. I tried it - it works. However, systemd version 224 has trouble with the rearrangement of Leap's apparmor startup. I have not looked at this in detail, yet. Nevertheless, have fun with veth devices in your virtual networks !